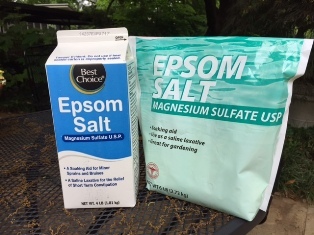 Epsom salt (magnesium sulfate) is a mineral compound that gets its name from a saline spring at Epsom in Surrey, England. The manmade form of it has been used for centuries as a “natural” remedy for a number of ailments and has some other important uses. Many enzymes in the body are regulated by magnesium. Soaking is said to help reduce inflammation, alleviate hardening of the arteries and improve muscle and nerve function. Sulfates improve the rate at which nutrients are absorbed and help flush out toxins that can ease muscle pain and improve cellular function. Both magnesium and sulfate are readily absorbed into the skin that makes the health benefits readily accessible. Stress can be caused by a deficiency in magnesium. Epsom salt dissolved in warm to hot water is absorbed through the skin and can naturally replenish lost magnesium that helps the body produce serotonin - a mood elevating chemical in the brain. Soaking in Epsom salt three times a week can help increase energy, improve mood and reduce the negative impacts of elevated adrenaline. Use about 2 cups of Epsom salt in each full bath. Epsom salt baths can relieve sore muscles, migraine headaches and even respiratory problems in some cases. Soaking sore feet in warm Epsom salts can help neutralize pain and foot odor. Dirty tiles in the kitchen and bathroom can be cleaned by mixing equal parts of Epsom salt with liquid soap. The mixture can be strengthened by adding orange oil, baking soda and/or hydrogen peroxide. Magnesium and sulfur are often deficient in soil and/or not available to plants. Epsom salt can be used in liquid sprays or soil drenches at about 1-2 tbs./gal. of water or dry at 5-10 lbs. per 1,000 sq. ft. around ornamental plants and food crops.